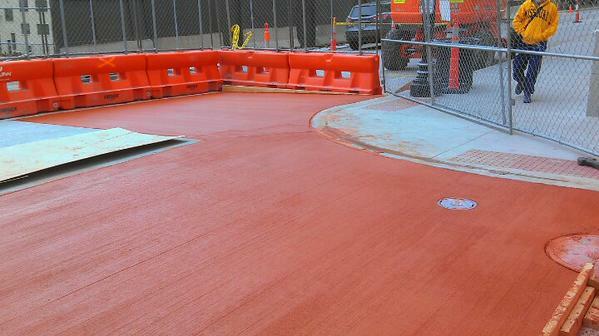 A few days ago a curious curvy concrete curb appeared at the northwest corner of 13th and Baltimore. This particular concrete curb is curious for a few reasons. First, it is curious that the curb appeared in the first place. This recently rebuilt corner was new and functional and generally getting along as a normal intersection sans curvy curb. Second, it is curious that whether by malice or confusion or convergence of circumstance, this new curb was strategically deployed to be as disruptive and dangerous as a quaint curvy curb can possibly be, poised to trip pedestrians entering the crosswalk in multiple directions, and perhaps collect rainwater as well. But the most curious thing about this new curb is that it represents the seventh version of this corner this year. Here is what the corner looked like to begin the year. It’s a bit worse for wear but generally functional, allowing people to comfortably enter the colored crosswalks on 13th and Baltimore. Likely disturbed by Downtown’s omnipresent utility work and construction, the ten year old intersection was reconstructed in January. Except that its new form lacked a key feature: The corner was rebuilt without any ramps, making it newly inaccessible to anyone with disabilities. Downtown residents and pedestrians noticed the oversight right away, and thank goodness, so that the error could be corrected with minimal expense. But the inscrutable workings of Public Works contracting do not abide nimble action, and so the construction was completed according to plan, if not policy. As the nature of the error became increasingly, relentlessly blatant, it was evident something must be done. Anything. 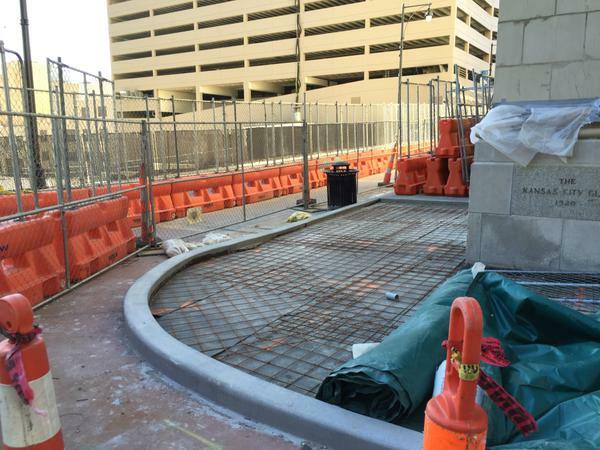 But certainly not rebuilding the brand new curb that was just constructed. Because that would make this whole undertaking look ridiculous. Instead, a solution deemed much less ridiculous was chosen for the corner’s third metamorphosis: tiny triangles. Tiny triangles do indeed connect the sidewalk and the street, much like a ramp is supposed to do, and this was unquestionably an improvement in circumstances from the previous improvement, which did not at all improve circumstances. But in addition to grossly violating all standards, these tiny triangles suffered from particular tininess and triangleness, creating a precarious perch that was not particularly safe for any users. These tiny triangles also created new protrusions into the actual street. Back to the drawing board. Do you think the curb is too high, my close-minded friend? Then you are approaching this all wrong. 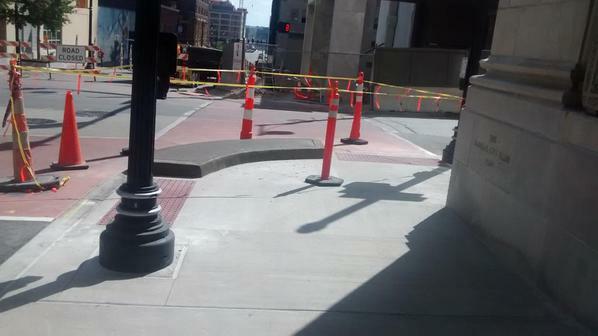 The curb was constructed exactly as intended (which you may have realized if you had more patience and foresight). Yes indeed. The curb is perfect. It is the road that is too low! And so for the fourth version of this curious corner, the entire intersection was raised so that it might transcend its lowly roadness and embrace the perfection of the new curb. At this point, the corner appeared to have earned a well-deserved happy ending. 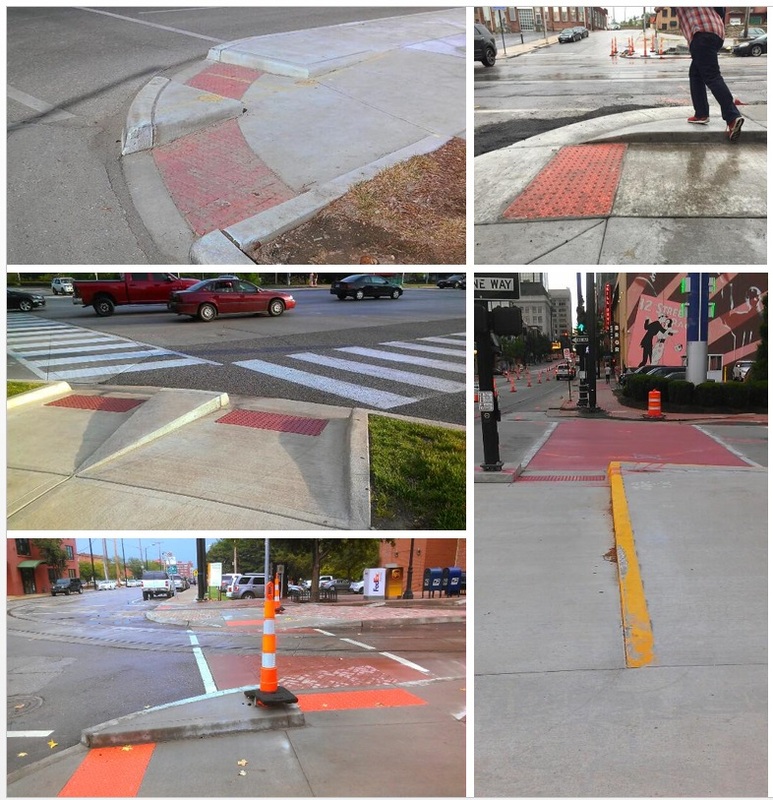 Crosswalks were comfortable and passable for all users. The intersection looked and functioned much like countless others throughout the City. In fact, the corner was working a little too well. People were not even paying attention any more. Well let’s see how blasé they are when they have to navigate: the pop-up pie. 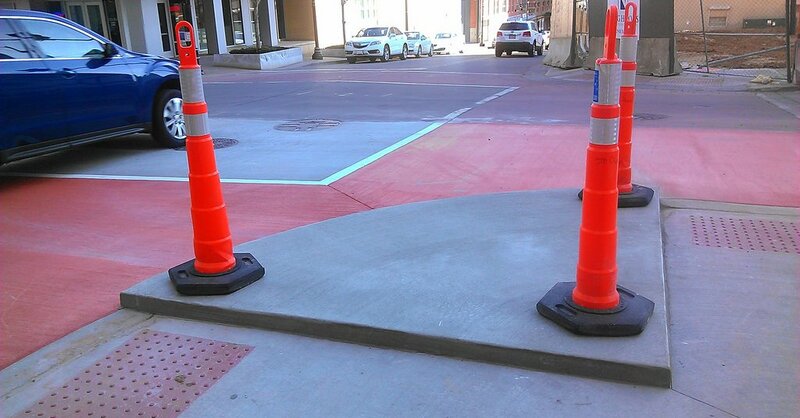 The fifth version of the corner, the pop-up pie is a marvel of design that manages to simultaneously provide ADA access while also introducing a unique new tripping hazard that blocks two crosswalks and most of the walking space for those merely turning the corner. And so we come to version six of the corner, which is much like version four incidentally, but now much older and unquestionably wiser. Having learned the lessons of the pop-up pie, the corner was again ready to be functional, comfortable, code-compliant, and live happily ever after. Sadly, the most content among us become restless from time to time, and this corner is no different. In a bid to recreate the halcyon days of several months ago when it was the talk of the town, the corner has taken its seventh and current form: the curvy curb. A more refined version of the pop-up pie, the curvy curb abandons efforts to disrupt sidewalk goers to focus more effectively on what is apparently its primary function: tripping people crossing the street. 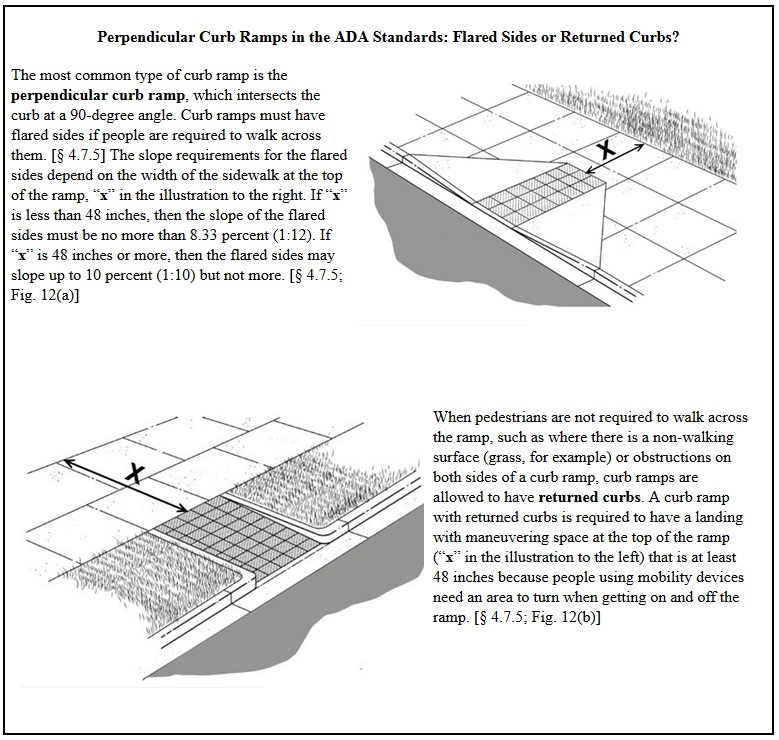 The federal government’s ADA guide recommends flared curb ramps as a standard. 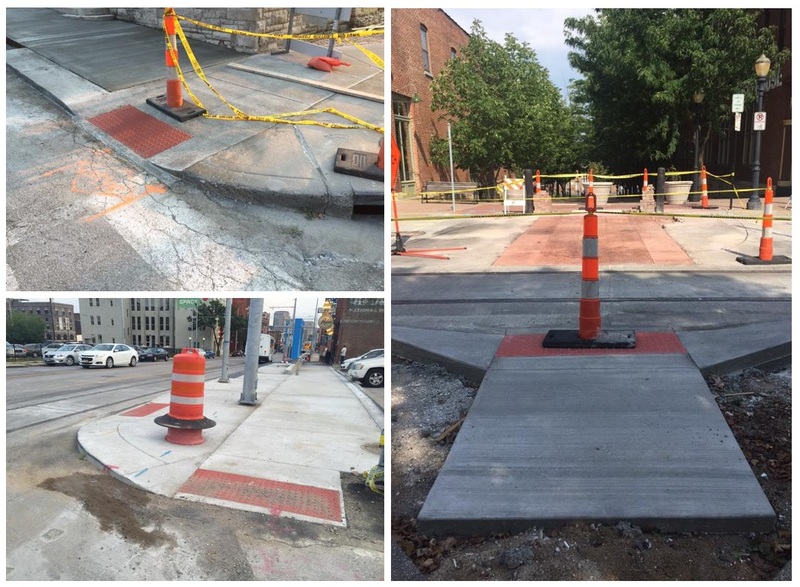 These ramps protect pedestrians on the sidewalk, provide a clear path for circulation, and provide safe access to the roadway for those with disabilities. 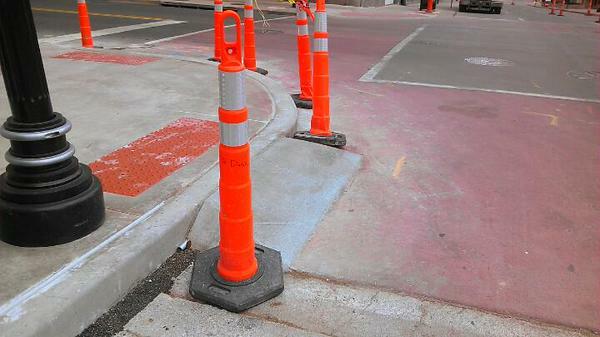 Return curbs are recommended only when there is not a path that the pedestrians are required to walk across. 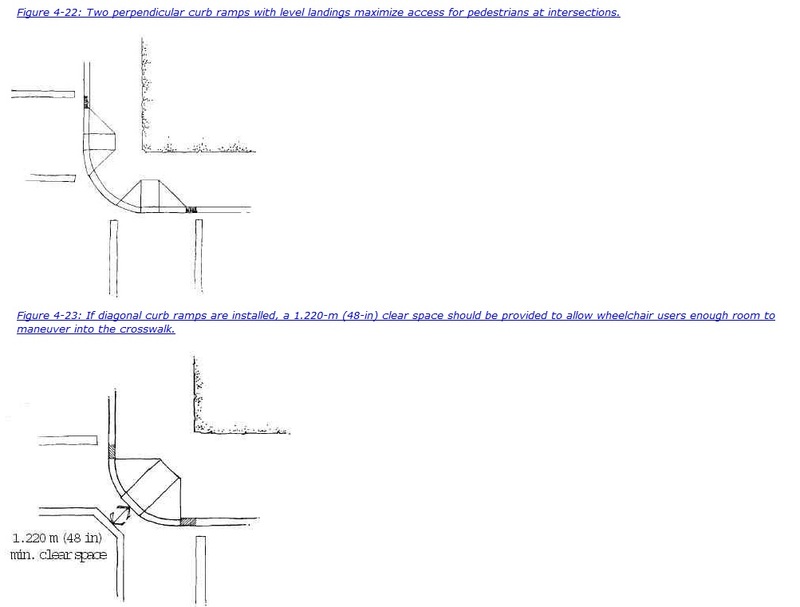 Recommendations for ADA access from the Federal Highway Administration are virtually identical. 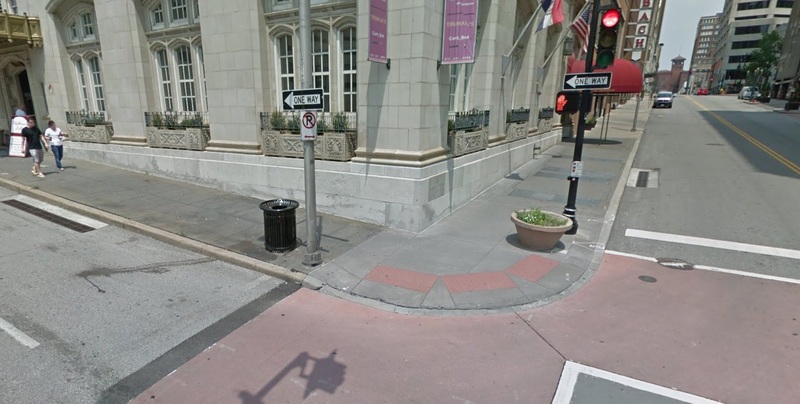 Someone, somewhere is deciding that these tiny triangles, pop-up pies, and curvy curbs are necessary, presumably driven by a desire to meet standards for ADA accessibility. But none of these solutions actually reflect recommended standards, so what is going on? This corner is by no means the only manifestation of this phenomenon in the City. 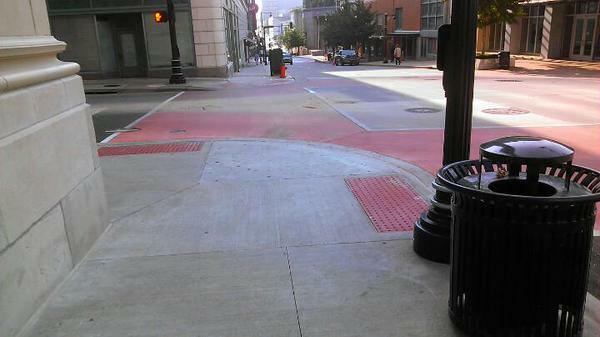 But there are also many old and new examples of quality crosswalk design throughout the City. So what is ultimately driving these particular protrusions? That’s the mystery of the Baltimore bumpout. Public works idiocy and engineering logic needs to be reigned in by the Planning Commission. They need to assign an urban designer to every single construction project in the right-of-way, so our public realm can be functional, beautiful, and built for people and by people – not by cad technicians that only know how to move cars.